Anglesea Barracks, headquarters of the Australian Army, Navy and Air Force in Tasmania, is the oldest military establishment in Australia still occupied by the Army. On his visit to Van Diemen's Land in 1811, Governor Macquarie was concerned about the troops' accommodation. He directed that barracks be built on a site since called Barracks Hill. The foundation stone of the officers' quarters was laid in 1814, several buildings were partially completed by 1818, and troops occupied the barracks area several years before that date. The Barracks, named Anglesea by Lt-Governor Arthur after the Marquis of Anglesey, Master-General of Ordnance in England, remained headquarters of the British military forces in Tasmania until the last regiment left in 1870. Most then passed out of military control, except for a small portion retained for the volunteer forces raised during the 1850s, and a permanent military cadre staff. Occupants of the remaining buildings included boys' and girls' schools, a girls' reformatory, aged women's home, gymnasium, weather bureau and the Royal Hobart Bowls Club. From 1898 the Ministry of Defence pressured for the return of the rented buildings, to permit occupation by an expanding defence force precipitated by the South African War (1899–1902), and the commencement of federal control. 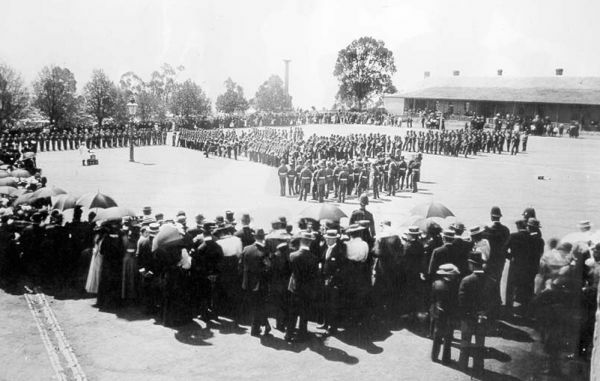 In 1901 responsibility for defence passed to the new Australian federal government. The Barracks passed back into full military control and has remained so ever since. Architecturally, the Barracks can be divided into three phases: buildings erected between 1814 and 1838, made of convict brick; those from 1838 to 1870, mostly local sandstone; and those erected since the turn of the century. Further reading: E Dollery, 'The Story of Anglesea Barracks', in A Rowntree (ed), Battery Point today and yesterday, Hobart, 1952.